Among the Mountain Top Historical Society's Archives is a collection of photographs and other items received as a generous donation from Ms. Wilma Kohler of Hunter and Elmhurst, NY. Among the items are a bible with family records of Aaron Haines, who operated the earliest inn in Haines Falls, a copy of the rare book, An Illustrated Guide to the Catskill Mountains by Samuel E. Rusk, and over one hundred photographs taken by Rusk, his brother John W. Rusk, and other 19th and early 20th century photographers. 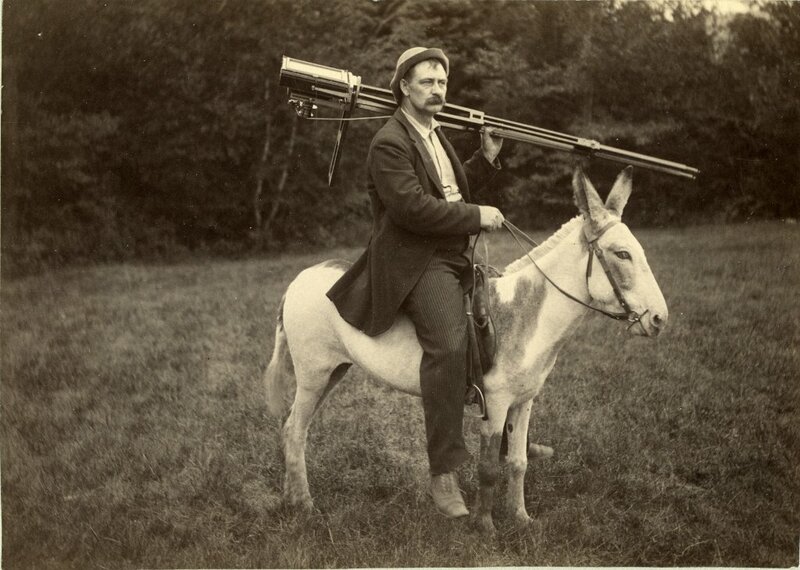 Samuel and John Rusk photographed local landscapes and operated a portrait studio in Haines Falls. A series of photographs depicting the construction of a portion of what is now Route 23A gives insight into road building techniques in 1907. The excellent quality of these late 19th and early 20th century photographs allows the society to enlarge portions of the images and bring out details not noticeable at first glance. A unique image of John Rusk (above) shows one reason for the high quality of the images – a large format camera that no doubt used large and exceptionally flat glass plate negatives. The photos have survived in pristine condition due to the exceptional care the professional photographers took in the preparation of the images and the manner in which Ms. Kohler cared for the collection. Society members and volunteers have digitally scanned, cataloged and secured the material. The donation, now designated as the Wilma Kohler Collection, takes its place with a growing amount of material that the society preserves and will be used in Society publications and for research on Mountain Top families and history.